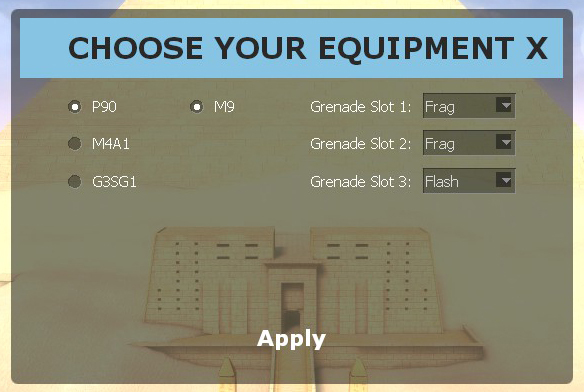 After starting the Mod and joining a server, you can select your team. 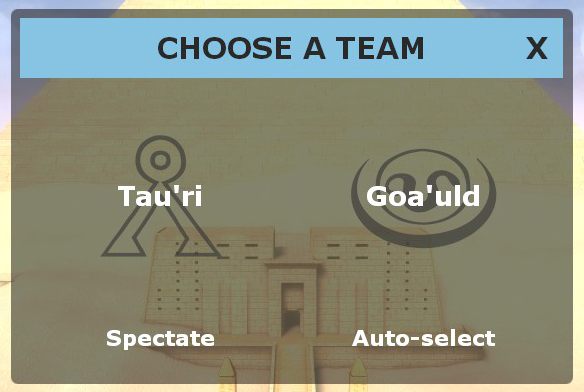 Hint: when joining an ongoing game, it is best to click on Auto-select as it will automatically place you with the team that currently has fewer players. M9 Beretta: The Tau'ri team's secondary weapon. Every Tau'ri spawns with one. Comes with one magazine already loaded and two magazines spare. With [Secondary Attack], a silencer can be attached. Semi-automatic fire mode. M4A1: Tau'ri team's default primary weapon. Like the FN-P90 and the G3-SG/1 Sniper, this gun comes with one magazine already loaded and three mags spare. Good all-round weapon. With [Secondary Attack], a silencer can be attached. Fully automatic fire mode. FN-P90: Tau'ri team's alternative primary weapon. Three mags like M4A1. Bigger magazines and higher fire rate than the M4A1, but less damage per bullet and bad at fights over long distances. Suited for close quarter combat. Fully automatic fire mode. G3-SG/1 Sniper: Tau'ri team's alternative primary weapon. Three mags like M4A1. Smaller magazines and lower fire rate, but higher damage per bullet and great at fights over long distances. Bigger zoom than M4A1. Semi-automatic fire mode. All of the weapons listed above can be aimed down the sights and also shoulder-fired (except the M9) by hitting the [Zoom] key, drastically increasing their accuracy and reducing their recoil. In the initial release, Tau'ri have two different types of grenades at their disposal. Three grenades can be carried at the same time. The Frag: You should already know the Frag Grenade from many other games. It can be tossed by using [Primary-Attack] and rolled on the ground by using [Secondary-Attack]. It will explode after a short amount of time, causing (possibly fatal) damage to players within it's blast radius. The Flash: The Flashbang will blind all nearby players looking in it's general direction and temporarily impedes the hearing when it explodes. Being flashed can be avoided by turning away and/or hiding behind crates, corners, etc. Be careful not to flash your own team! Additionally, Tau'ri solders carry a standard issue combat knife (the M9 Bayonet) and an Epi(nephrine)Pen for a small health boost. With an EpiPen you can inject yourself or - even better - a teammate for a slightly more potent result of the injection. The Goa'uld team's primary weapon is the Staff Weapon (in the initial release, this is the only primary weapon available to the Goa'uld team). It fires plasma bolts that cause severe damage to players or objects hit by them. The Goa'uld team's secondary weapon is the Zat (Zat'n'kitel). It fires a burst of electricity, which will only stun an enemy for a short time with it's first shot, taking away half of his health. The second hit will kill. Compared to other Goa'uld weapons, the fire rate is very high. 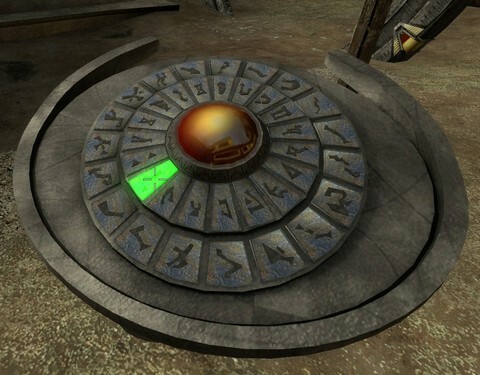 All Goa'uld weapons have infinite ammo, but after a few shots in quick succession, they will have to cool down or recharge for a few seconds. In the initial release, Goa'uld have two different types of grenades at their disposal. Again, three grenades can be carried at the same time. The Frag: See Tau'ri description above. The Shock: The Goa'uld Shock Grenade does not only blind an opponent, it also impedes their movement. Again, be cautious not to accidentally blind/shock your own team. Additionally, a Jaffa never enters a battle without their trusted Jaffa Dagger. Tau'ri projectile weapons have to be reloaded. A player can carry a certain amount of ammo with him/her. Instead of having an "ammo pool", like in Counter-Strike for example, ammunition is strictly magazine based. When ejecting a non-empty mag, the player will keep it for later re-use. Magazines will always be cycled through in an order so that the next mag the player's character will take is the one with the most ammo in it. Empty mags will be dropped automatically. For a normal reload as just described, you simply press the [Reload] button. Should you run out of ammunition, another player with the same weapon can give you some of theirs by pressing the [Use] key while standing nearby and aiming at you. Alternatively, you can walk over a dropped weapon that of the same type as yours and pick up ammo left within it. Magazines that are not currently used in your gun, will be refilled. To the upper left of your screen, you can find the radar. The center of the radar represents your own position. 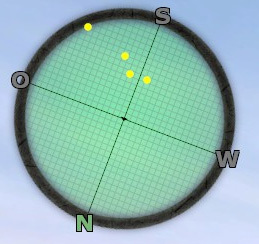 Teammates around you are represented by yellow circles. Sometimes objects relevant to the mission are also shown on the radar (typically in blue). Below the radar, you will find the name of your current location. You can use these names to communicate to your teammates where you are. If two lines are shown, the first line indicates the name of the planet and the second line names the area you are currently in. If it's just one line, it means that the current map is set on a single planet. 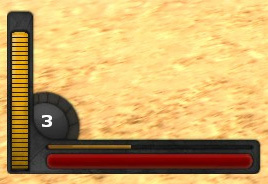 To the lower left, you can find your health-bar (red), your stamina-bar (yellow, horizontal) and your ammo-counter (yellow, vertical). The white number represents your spare magazines. To the top of the screen, in the middle you will find information about the state of the current game or round. 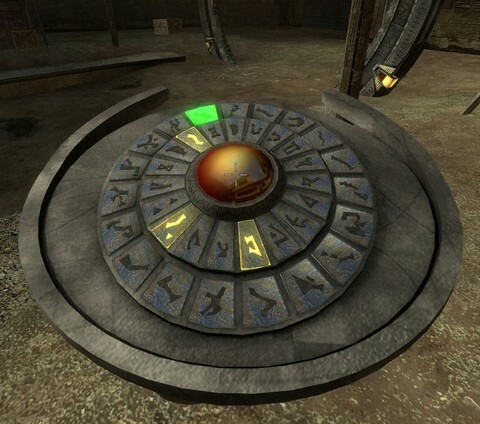 For instance, it could be the current objective in an Assault game (see example below), the score of the teams in Capture Alien Technology or Frag Race or the state of the flags in Capture the Flag. In addition, you can view your statistics and objectives with the [Tab] key (only visible for as long as you press the key). The Overview Map (also called "Spawn Selection"), usually opened with the [N] key, shows all areas (or planets, depending on the game mode) in the current map. The orange and green circles are the different spawnpoints you can select, by simply clicking on them. 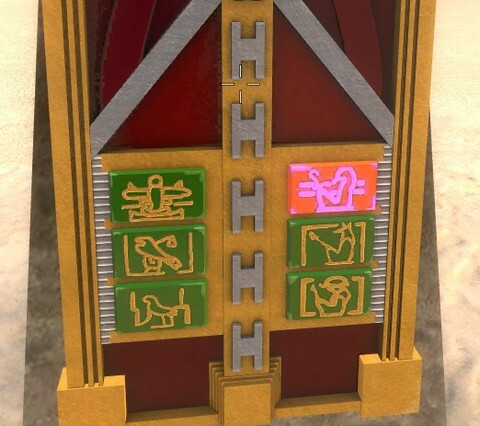 Orange represents Goa'uld, green represents Tau'ri and white icons with a lock in it are spawnpoints that are currently unavailable (but might be unlocked later on, in "Assault" game mode for example). Ring Transporters offer an easy way of traveling between two points on the same planet, or a space ship in orbit. 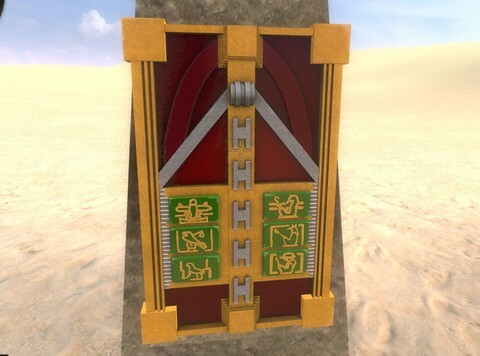 They are mostly found on planets that are/have been inhabited by the Goa'uld/Jaffa or the Ancients. 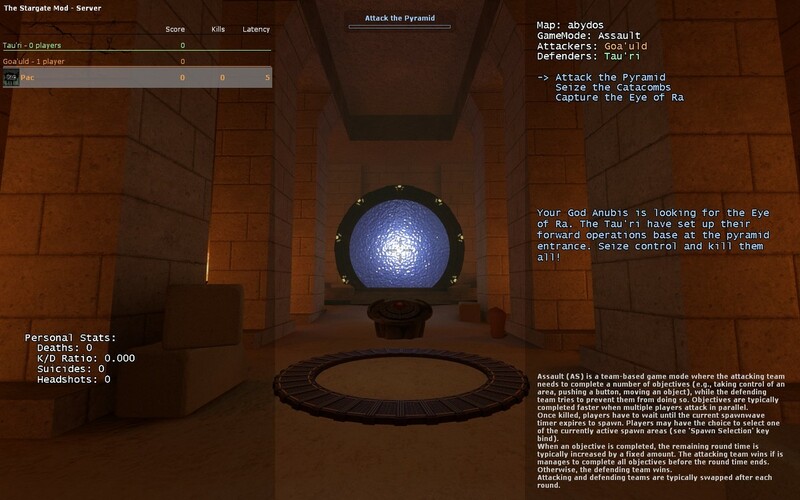 When activated, objects (and players) inside the rings are teleported to another location. Notice that teleportation is bidirectional: the objects inside the righs are simply exchanged. Ring Transporters are typically controlled with a Ring Transporter Panel, which has six buttons to enter the destination address to teleport to. By pressing the [Use] key on the panel itself (not on one of the buttons), you can open the following menu, presenting you with all the different destinations on this planet or spaceships in the orbit you can dial to (if nothing is shown, the Ring Transporter is most likely currently disabled). Choose one of the available targets and confirm your selection. The menu closes and the first symbol to dial is highlighted in red color. Press the respective button by using the [Use] key. When done, the next symbol will highlight and so on. After entering the sequence, hit [Use] again while aiming at the center of the dialing device and hurry to position inside the Ring Transporter! Hints: activating the rings is quite loud. Enemies close to your target destination will almost certainly know of your arrival. 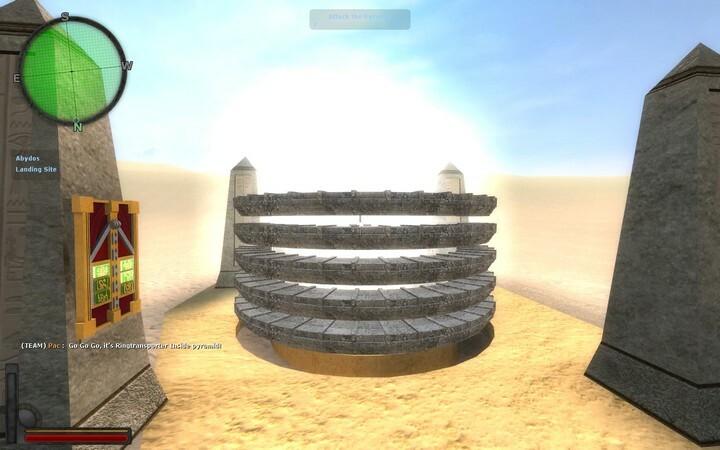 You can also transport grenades and other objects through the rings. It's all a matter of timing and being in the right position to throw the object into the rings. Of course it is also possible to dial an address manually (i.e., without the menu). 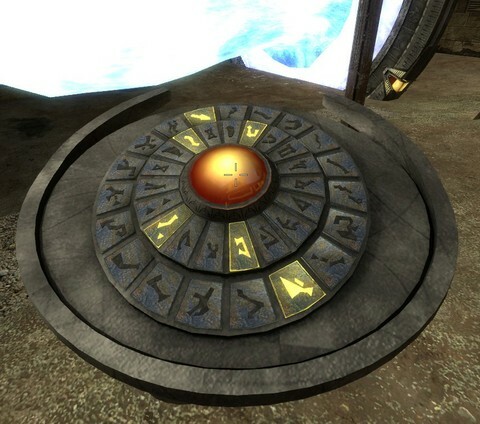 A DHD is used to dial the address a Stargate should connect to. An address consists of at least six glyphs, followed by the glyph representing the so-called Point of Origin. 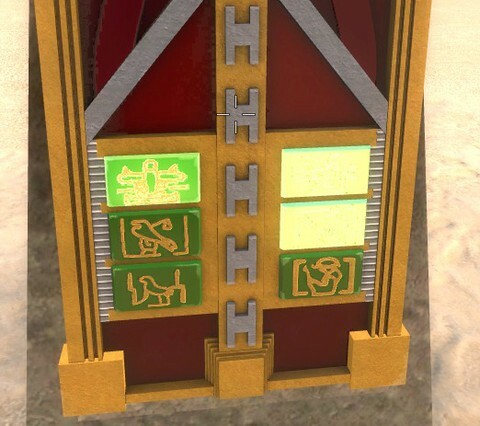 Notice that in The STARGATE Mod, you do not need to dial the Point of Origin – it is automatically appended when the "red button" in the middle of the DHD is pressed. Similar as for the Ring Transporter Panel, select the target address to dial to. A message is displayed in the teamchat, as soon as a member of your team initiates the dialing sequence (only if that player is on the same planet than you are). The glyphs to dial will be highlighted one after another. 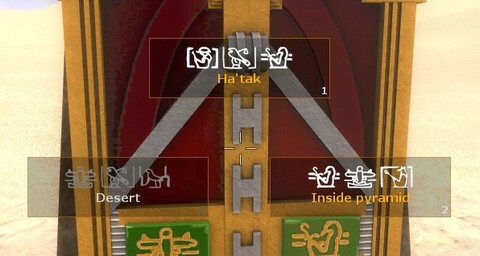 Press the [Use] on them to enter the respective glyph. 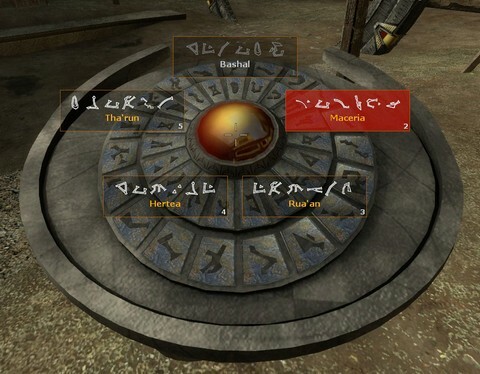 On the Stargate, chevrons will be activated separately, along with your activation of the corresponding buttons. Notice that hitting the wrong glyph will most likely make you end up with an invalid address! Press the "red button" in the middle of the DHD to restart from scratch. When the last glyph has been entered, no button is highlighted any more. In this case, hit the "red button" in the middle of the DHD to confirm the selection. 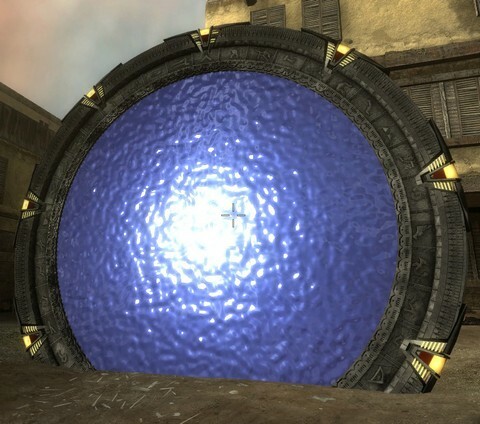 If you did everything right and the destination Stargate is currently not connected, the Stargate will open and outgoing wormhole to the destination address. 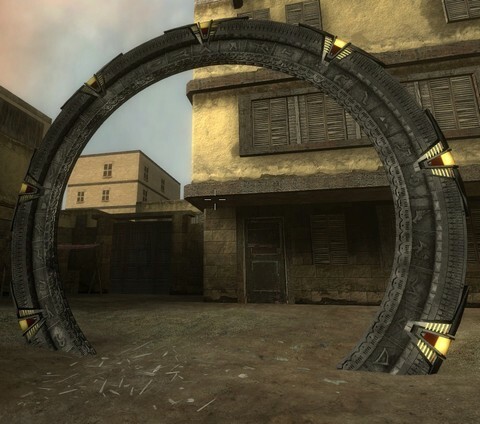 Notice that even if you entered the destination address correctly, the connection might fail if the destination Stargate is currently connected or if your planet receives an incoming wormhole while you are dialing the DHD. Hint: of course it is also possible to dial an address manually, provided you can remember it. This allows for even faster dialing, which might be essential during combat. A ZPM serves as an extremely powerful energy source in the Stargate TV show. You are not able to use your primary weapon while carrying a ZPM (because of your hands being blocked). Each of these ZPM Hubs can store up to three ZPMs. 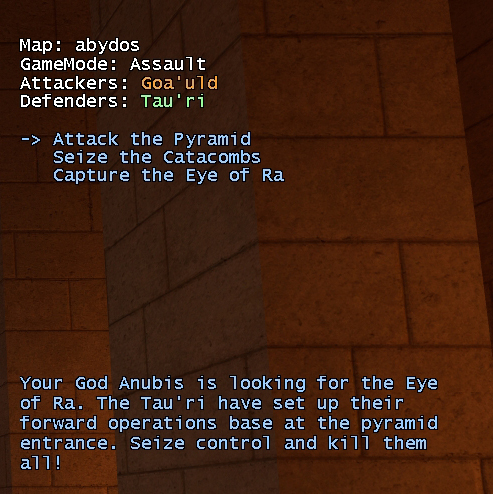 Notice that ZPMs can be stolen from your ZPM Hub by the enemy team! Deathmatch (DM): Classic "Free for All". The objective is simple: kill everyone you see, but do not get killed yourself. Each kill earns you a point, and at the end of the round, the player with the highest score wins. Spawns are randomly spread across the map. Team Deathmatch (TDM): Same principle as in Deathmatch, only this time around, you have a team at your back (which you should not kill). Goa'uld (Jaffa) fight against Tau'ri, and the team with the higher score wins. Last Man Standing (LMS): Same as Deathmatch, only there are no respawns. Once you die, you have to wait for the next round in order to respawn. Winner is the player who survives till the end (the "last man standing"). Last Team Standing (LTS): Again, same principle as in Team Deathmatch, but without respawns. Eliminate the other team before your own gets wiped out. 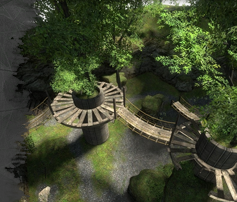 Capture The Flag (CTF): A CTF map has two bases, one for each team. Your goal is to capture the enemy flag and bring it back to your home base (your flag must be at your base for this to work). Bringing the enemy flag back to your base will grant your team a point. The team with the higher score wins at the end of the round. While carrying a flag, you can only use your sidearm. Frag Race (FR): Team Deathmatch with a special set of rules. Each team has a kill (or "frag") counter and a team-score counter. Once the frag count becomes greater than the team score (zero in the beginning), one point is added to the team score while your frag counter and the opposing team's frag counter is reset to zero. The team with the higher team score at the end of the game is the winner. 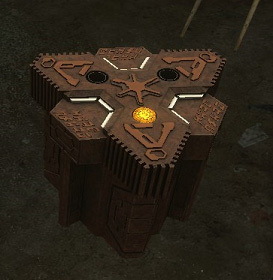 Capture Alien Technology (CAT): A CAT map has two bases, one for each team, sometimes located on different planets. 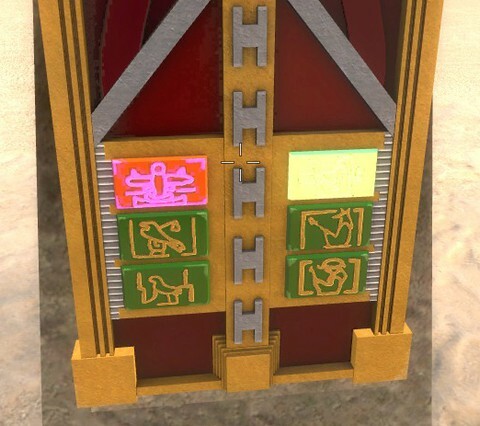 Each team needs to collect a certain number of alien artifacts by capturing (depositing) them in respective slots in their base. Artifacts are usually randomly distributed over the planets of the map. There are typically not enough artifacts available for both teams to reach their goal. 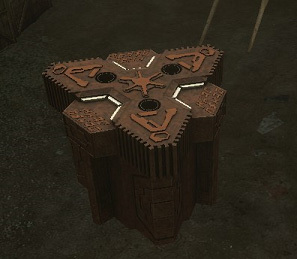 Hence, in addition to searching for artifacts, players may also steal captured artifacts from the opposing team's base and return them to their base. 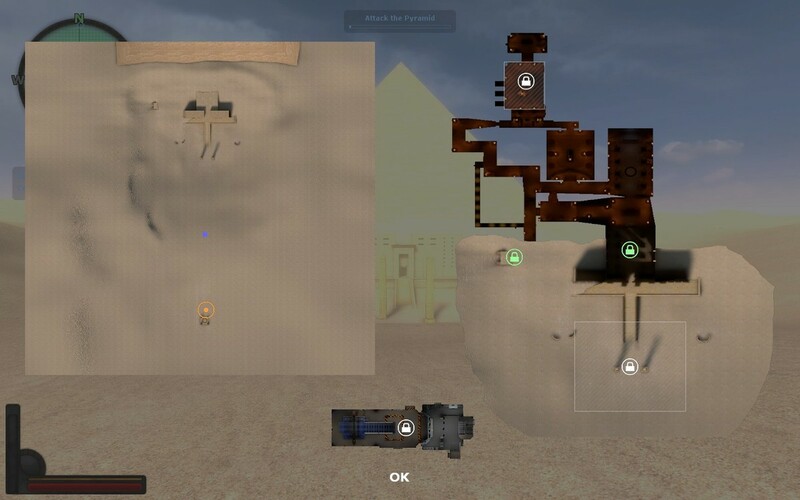 The team that manages to capture the required number of artifacts first, wins the round. While carrying an artifact, you can only use your sidearm. Assault (AS): A game mode where one team attacks while the other one defends. The attacking team wins if it manages to complete all objectives before the round time ends. Otherwise, the defending team wins. Players may have the choice to select one of the currently active spawn areas by pressing the [Spawn Selection] key. Attacking and defending teams are typically swapped after each round.